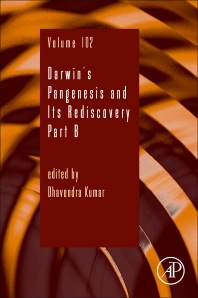 Darwin’s Pangenesis and its Rediscovery Part B explores Darwin's Pangenesis, an expanded cell theory and unified theory of heredity and variation from over 150 years ago that strengthened his theory of evolution and explained many phenomena of life. Now, new discoveries on circulating DNA, mobile RNAs, prions and extracellular vesicles are providing striking evidence for the chemical existence of Darwin’s imaginary gemmules. In addition, new evidence for the inheritance of acquired characters, graft hybridization, and many other phenomena that Pangenesis supposedly explains are progressing, and are hence explored in this comprehensive volume. Specific chapters in this new volume include Darwin and Mendel: The Historical Connection, Darwin’s Pangenesis and Graft Hybridization, Darwin’s Pangenesis and Medical Genetics, Darwin’s Pangenesis and Certain Anomalous Phenomena, and Natural Selection and Pangenesis: The Darwinian Synthesis.